With the discovery of Miriam Lass (Anna Chlumsky) at the bottom of a drainage pipe, or a well of some sort, Jack Crawford (Laurence Fishburne) is thrown back into the past, back into his own mind wondering if there were anything he could have done, anything at all possible to have spared his trainee such hardship. Fishburne is someone I don’t mention often enough as being an incredible part of this show. He’s always been interesting to me, ever since I saw him so young in Apocalypse Now I’d always be excited to see anything else he was in. The way he plays Crawford is perfect – we see both the toughness in Jack, as well as the softer side and his weaknesses. Mostly there wasn’t enough of the character in any of the Thomas Harris adaptations; everyone who played Crawford was great, they simply didn’t end up onscreen enough for the character to be fleshed out. So to watch Jack and Miriam here at the beginning is pretty excellent, and also sad. She doesn’t blame Jack in any way, however, it’s clear he’ll never stop blaming himself. We’re truly seeing the ultimate manipulation of Hannibal Lecter (Mads Mikkelsen) as this season pushes on. Because even with everything seemingly mounting against him – Lass is discovered, Will Graham (Hugh Dancy) is being proven not-guilty of the murders he’d previously been accused of – somehow, Hannibal skirts around the edges of ever being pegged as the Chesapeake Ripper. Even while Lecter stands next to a mirror of two-way glass, in an interrogation room with Dr. Alana Bloom (Caroline Dhavernas), on the other side Miriam tells Jack that he is not the Ripper. There’s no telling what, and how much of it, he did to her. She has been damaged beyond repair. But never forget, Hannibal is a fan of the unorthodox in psychology; psychic driving, and such. I’m sure he’s up to naughty, naughty business. Finally, Graham is being released from the Baltimore State Hospital for the Criminally Insane. He’s a little irritated with Chilton, only because the doctor has yet to willingly divulge his bonding with Lecter over the unorthodox – Lecter with Will, Chilton with Abel Gideon (Eddie Izzard). Will warns that the Ripper will come for him soon, should he not confess all he knows about the other, much naughtier doctor. This is another tipping point for Jack and Will, as well. Now that Jack realizes Will is not crazy, even though Miriam stated Hannibal is not the Ripper, he is starting to come towards the light. He might not know how the pieces fit together, and he may yet still stray into the wrong direction, however, he’s at least giving Will a chance to put all the pieces back together, to try and reconstruct more of the Ripper’s thinking. Luckily now that Graham is out of a cell, back into his old treacherous stomping grounds of macabre crime scenes, he can do more than waft through his own memories; he can step right into the Ripper’s territory. What’s interesting is when Will goes into his head and tries to reconstruct things from the room where Lass was found. 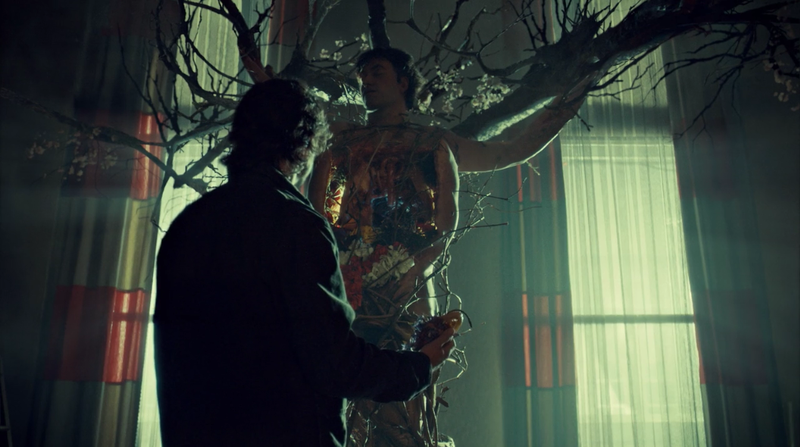 We go back to the councilman whom Hannibal threaded into a tree, the one whose chest and torso were filled with poisonous flowers. Will sees it all as if he were standing in the office of Lecter, the tree and the man woven into it standing there next to the windows. Graham knows for sure some evidence will lead the FBI and Crawford away from Hannibal, he also understands that Miriam being found is a gift from the Ripper; she was not discovered, she was left to be found. So why would Hannibal do this? It’s all a part of his plan. Again, we’re also seeing how intelligent he truly is, because after all he is this brilliant doctor, he’s a culinary genius, he can still stitch and sow like the best of surgeons, he’s a literary encyclopedia, so why shouldn’t that be followed with further intelligence? With the Mads Mikkelsen Hannibal, we’re seeing a broader scope of the sassy, sweet talking villain than ever. With his plans, such as the one focused on Miriam Lass, Hannibal is showing off his prowess, peacocking as he likes to do so often. Unfortunately, poor Alana Bloom has not yet seen the darkness inside the Nightmare Man, the one she still sees simply as Hannibal Lecter, oh-so helpful psychiatrist and friend and recently lover. Will still feels for her, obviously, but he’s mostly concerned about her safety in the end. He knows what the man is, deep down, under that human veil. 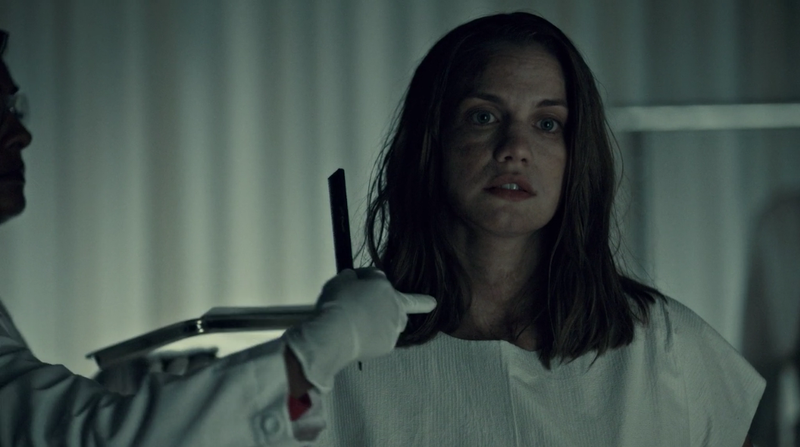 Alana has been culpable already, technically, in Hannibal taking Gideon from the hospital; albeit unknowingly. She’s in for much more madness than she has yet to see as a doctor in her own right. I also loved the scenes between Will and Miriam. Because we’re seeing two of the most manipulated people under the influence of Hannibal Lecter. While Miriam still doesn’t know/understand it was Lecter, Will does know exactly who did what he did to him. All Lass can really remember is a flashing of light, a voice, chamber music. Her memories sort of blend into a strobe-like vision of a dark, cloudy figure standing a ways away, speaking in a muddled voice. 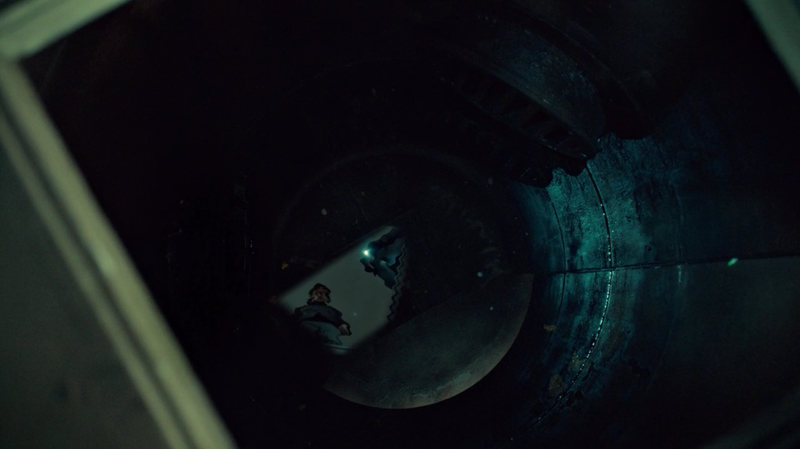 What I love about this is we see how, despite his intellectual prowess, Hannibal is scared of death like anyone else. 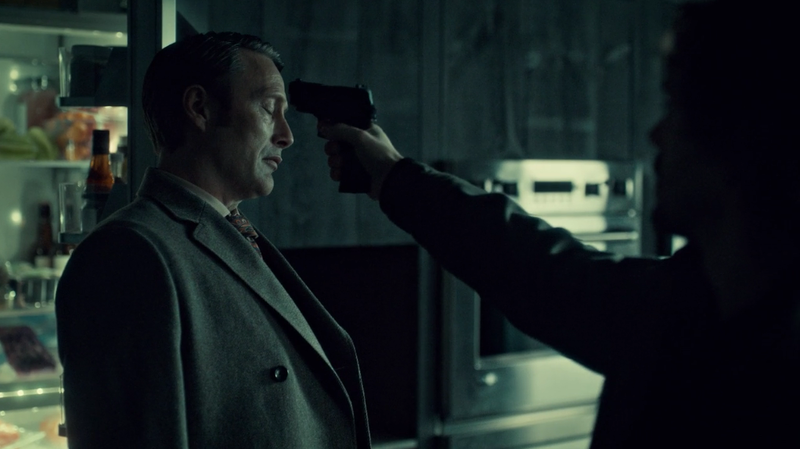 He can’t look at Will in the eyes, as Graham points a gun to his head. 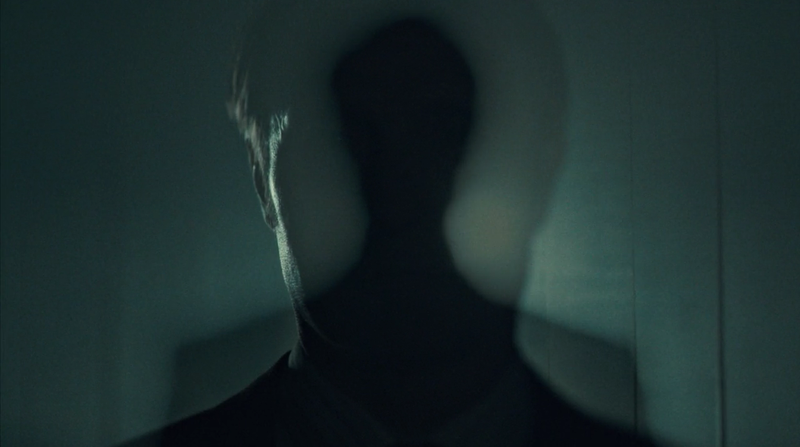 Only once he feels Will disappear does Dr. Lecter open his eyes to see if he’s actually gone. Great little moment, which speaks volumes. Underneath that five-piece person suit, Hannibal the Cannibal has clutches of humanity left. There are more wonderful bits with Miriam and Hannibal. I don’t want to spoil too much, like I’m sure I have already, but to see Lass sifting through Hannibal’s pictures gives us a clearer picture of how deeply, psychically driven Miriam has become under the Ripper. He clearly blasted the memories out of her head and replaced them with whatever he wanted. Hannibal, with Jack alongside, has Miriam try to recover her thoughts; pretty ballsy. This is more of Bryan Fuller & Co’s excellent use of Alfred Hitchcock’s favourite principle – the bomb under the table. Let the audience see it, then let ’em sweat until the thing blows. With Miriam, and everything else, we know ourselves that Hannibal Lecter has done the deed – yet until everything unravels for sure, we have to sweat everything out. Which is incredible. Especially once things progress in this episode. 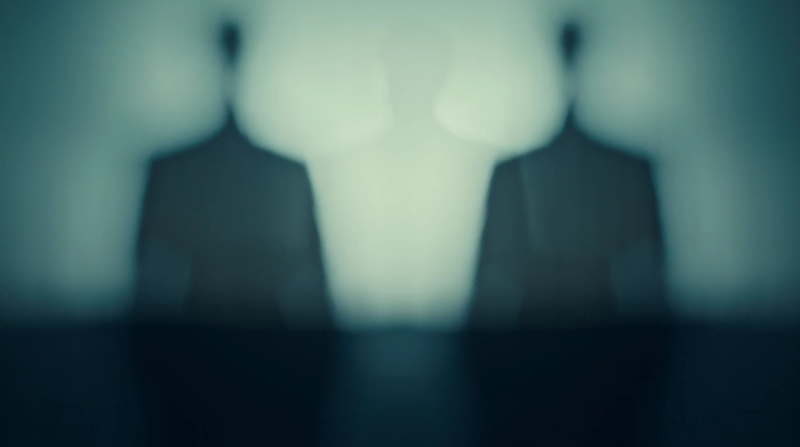 Spooky and awesome scene as Dr. Chilton arrives home – just as the FBI plans to question both him and Lecter – to hear a heart rate monitor somewhere in his home. Going downstairs, past the chic wine cooler, he opens up one of his doors to find Abel Gideon, or what’s left of him, set up on an operating table – bits of his leg are already sliced off into a nice looking steak. 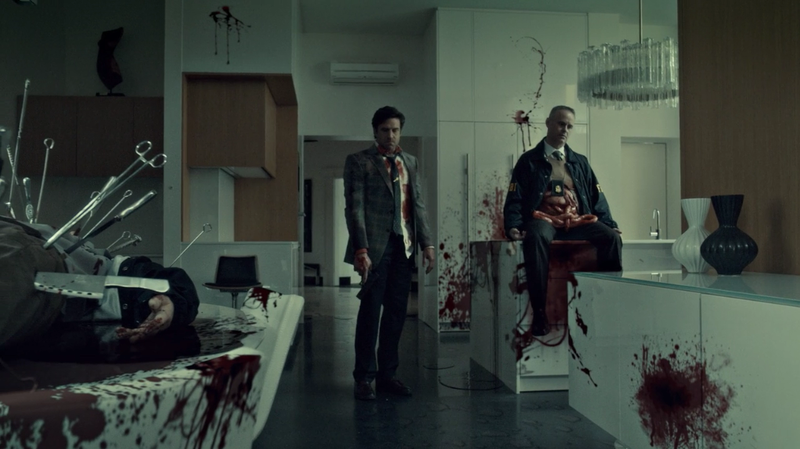 Upstairs, though, Hannibal waits for him. With plans. I won’t spoil it for those who’ve yet to see, but WHOA – some excellent blood, gore, and confusion when poor Chilton opens his eyes again. Then with more of the end results from Dr. Lecter’s newest experiment. He took two variables – what Chilton might do under threat of arrest for the Ripper’s crimes + what Miriam Lass might do if/when confronted with someone she believes to be the Ripper – and then we see the vicious results of what he has brought out in everyone. To see all the evidence piling up against Chilton, it’s almost too easy. Yet still, Jack Crawford and the FBI appear to be falling into another trap, again, setup by the naughty doctor from behind the curtains. Meanwhile, the only one who knows Chilton is innocent is, of course, Will Graham. Jack still thinks the Ripper is playing Will, but we know the truth. It’s frustrating to watch, in the sense of wishing the characters would figure it out – it’s not frustrating in the sense it makes me mad at the show. This is excellent storytelling, and it’s a great way to incorporate Frederick Chilton further into the story of Will and Hannibal instead of him only being a relatively minor character, especially in Red Dragon. Loved this episode. This really takes things up a notch because there’s so much confusion swirling around Jack Crawford, as well as the rest of the FBI. All the while, Will Graham holds the pieces. Eventually he will help everybody else come to realize who/what Hannibal Lecter is underneath his finely tailored, luxurious, murderous person suit. Not only that, Will is putting himself back in the hot seat – he agrees, in a way, to become Hannibal’s friend. 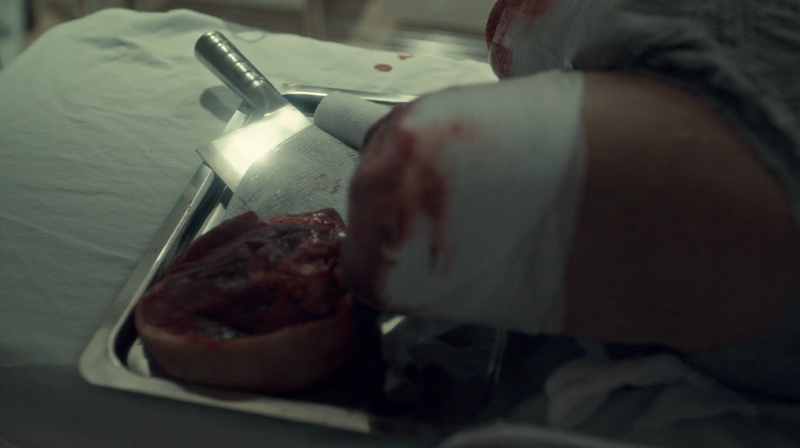 Though the friendship is over the way it first began, this is something new; what Lecter has wanted all along. And this way, Graham is able to reinsert himself into the life of Hannibal, in a way different from before. This way, perhaps, he might come to discover more about the mysterious and naughty psychiatrist. What an end to this episode! Incredible stuff.